Ever-popular ABC radio announcer Ian 'Macca' McNamara is currently on a self-drive tour with his Australia All Over program. Macca is one of Australia's favourite radio presenters, and his program is heard by an estimated two million listeners each Sunday between 5.30am – 10am. His laid-back mix of music, stories and down-to-earth callers and guests are what makes his program a staple diet for many Australians. Macca's "SAY G'DAY" tour commenced in Queensland on February 11, 2008 and will continue to late March. He'll be travelling through parts of Queensland, New South Wales, South Australia and Victoria, and be recording and conducting live interviews with guests. He'll also be meeting up with those keen to say "G'day". For detailed information of Macca's tour, check the ABC website. This week I’ve had the pleasure of licensing an image for 10 years to the Melbourne Museum. 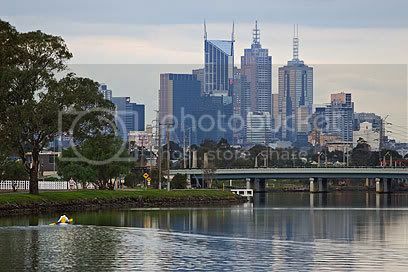 The photograph, of the Melbourne city skyline, will be displayed in an audio-visual as part of The Melbourne Story exhibition in the Australia Gallery at the museum from March 20, 2008. Interestingly, the image was discovered at RedBubble in my portfolio of work. The exhibition is said to be the largest ever developed by the museum and will present life in Melbourne from the 1830s to the present. 11 Nicholson St, Carlton, Melbourne. Admission: Adult $6.00, Concession and Children free. It’s been cheekily said over the years that the best thing to come out of Melbourne is Sydney Road (Hume Highway). For those heading out of Melbourne and feeling parched and hungry, the First And Last Hotel is the last pub you’ll pass before entering the M31 Hume Highway. First impressions are the place looks runs down, but don’t be fooled – it’s decorated in a theme resembling the days of the Wild West – yee ha! You won’t find any gunslingers here though, as the boys in blue are handily stationed across the way. The interior of the bistro is rustic. Timber floor boards, timber tables, timber chairs – it’s all got that chunky look to it. Nice. How many pubs can you eat at and sit under a pitched corrugated roof? Yeah, you can here and the paint’s even peeling off the roll barge. After you’ve been seated by one of the friendly staff, you can sit there gazing at the passing traffic on Sydney Road. What other free entertainment did you expect to see outside the windows? The tucker. It’s good wholesome grub that’s reasonably priced. I ordered the Brew Fish and Chips with vegetables. Lovely fish fillets in a crispy beer batter, and boy was it fresh and hot! The chips were chunky and there were plenty of them on the plate waiting to be devoured. The vegies were a mixture of pumpkin, sliced carrot, red pepper and zucchini. No complaints here let me tell you. A top deal for $18.00. Oh, and the tartare sauce was yummy, too. The better half indulged a chicken in pyjamas – oops, I mean she ordered the Chicken Parmigiana. That arrived with steaming hot chunky chips and a generous side salad. Looked good to me, and was given the double thumbs-up by the good lady. Only $19.00 and good value – the piece of chicken was man-size. Beer and soft drink? A cold Carlton Draught is $3.50 a pot, and a pot of Coke is $3.10. The two pots of ice water cost nix. There’s a children’s play area at one end of the bistro for those energetic youngsters who don’t eat their tucker when their parents have already paid for it. The First And Last Hotel has a Sports Bar with TAB facility, plenty of pokie machines, and most importantly a relaxed atmosphere. It’s a good local pub that beckons a return visit. Recommended. This review can be downloaded and listened to on your computer for FREE via MediaFire. You will require Windows Media Player to listen. The file size is 765kb. Darren Stones First And Last Hotel review - audio. “Sorry”, but where is John Howard? The Australian Parliament said “Sorry” to Australia’s indigenous people on Wednesday 13th February, 2008. The apology, delivered by Prime Minister, Kevin Rudd, at Parliament House in Canberra, was directed towards Australia’s indigenous Stolen Generations. Rudd’s speech was well received and it’s instilled a new sense of direction for all Australians. It’s been a long time coming, but it’s finally happened. A cloud has been lifted due to Rudd’s willingness to “close the gap”. The gap he refers to is; the difference in life expectancy and opportunity between indigenous and non-indigenous Australians. Federal Opposition Leader, Dr Brendan Nelson spoke and was subsequently criticised for part of the content of his speech. Many people were appalled by his words and they turned their back on him as he continued to deliver his speech. Nelson said there shouldn’t be a compensation package, but that is a key issue Professor Mick Dodson, Director of Aboriginal Studies at the Australian National University, is intending to pursue in due course. Nelson was in a difficult situation due to the Coalitions’ stance up until recent times, but Rudd was willing to lead him through the process. It’s questionable whether Nelson’s words were offensive, as it seems there’s a hangover from the Howard years. It could be assumed that indigenous Australians were ready and willing to direct a protest towards the Federal Liberal Party. Fair enough – the Liberals had 10 years to say “Sorry”, but it all seemed too difficult for them. Former Australian Prime Ministers, Gough Whitlam, Malcolm Fraser, Bob Hawke and Paul Keating, attended the announcement. But, there was only one living Australian Prime Minister absent – John Howard. Howard was Australia’s prime minister for 11 years, and he led the coalition to a crushing defeat in the November ’07 Federal Election. Is Howard still hurting from losing his long-held seat of Bennelong to Maxine McKew? Howard has rarely been seen in the public eye since being defeated. On the day that Rudd said “Sorry”, Howard was photographed whilst taking his morning stroll. It was a day that Howard should have been standing shoulder-to-shoulder with Whitlam, Fraser, Hawke, Keating and Rudd. Maybe time will heal Howard, maybe not. Rudd’s fired the starting gun and the vast majority of Australians are willing to join the race. Maybe Howard will get caught in the slipstream, maybe not. It’s up to Howard to move forward. Australia is looking for John Howard to step forward and show leadership.